PT Jasa Raharja (Persero) – Jasa Raharja is a well-established state-owned financial services company in Indonesia with core business competencies in social insurance. Jasa Raharja operates primarily as a provider of accident insurance. PT Jasa Raharja (Persero) was first established in 1960 as Perusahaan Asuransi Kerugian Negara (PAKN) Ika Karya. In 1970, the Company renamed into Perusahaan Umum Jasa Raharja. The name of PT Jasa Raharja (Persero) officially launched in 1980. Jasa Raharja is a non listed state-owned company and is completely owned by the Government of Indonesia which represented by the Minister of State-Owned Enterprises (SOE). Jasa Raharja is based in Jakarta and now has 29 branch offices, 63 representative offices, 67 service offices (KPJR) and 1,285 joint offices with SAMSAT spread across Indonesia (as of December 2017). Its head office is registered at Jl HR Rasuna Said Kav C-2, Kuningan Jakarta Selatan 12920. PT Jasa Raharja (Persero) also supported by 1 subsidiary company, namely PT Jasaraharja Putera which focus on general insurance and surety bond guarantee business. According to information found in PT Jasa Raharja (Persero) Annual Report 2017 as cited by JobsCDC.com, Jasa Raharja succeeded in posting excellent financial performance in the business year of 2017. Jasa Raharja booked total assets of Rp 15.05 trillion in the end of 2017. This number is up 14.68% from the same period previous year. Jasa Raharja’s total assets as at the end of 2016 amounted to Rp 13.12 trillion. Referring to its annual report, total underwriting income in 2017 amounted to Rp 4.86 trillion. This reflected an 7.82% increase from Rp 4.50 trillion in 2016. 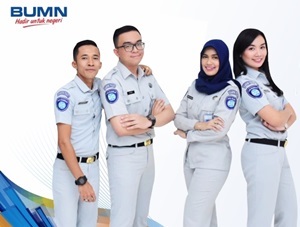 SMA/SMK or equivalent : maximum age of 22 years old. Diploma or equivalent : maximum age of 25 years old. Bachelor Degree (S1) : maximum age of 28 years old. Master Degree (S2) maximum age of 33 years old. Disabilitas (SMA/Diploma/Bachelor) : maximum age of 45 years old.